Missing teeth can significantly impact your self-confidence and your oral health. If you are looking for options for reliable, long-lasting tooth-replacement, dental implants are one of the best solutions available. At San Gabriel Valley Family Dental, our team of skilled and compassionate dental care professionals proudly offer dental implant treatment to patients throughout the San Gabriel and surrounding Los Angeles communities. If you would like more information about how dental implants can help improve the long-term health, function, and beauty of your smile, contact our welcoming and knowledgeable team today to schedule your initial consultation! Why Choose Dental Implants for Replacing Missing or Lost Teeth? Dental implants differ from the many alternative tooth-replacement solutions because they completely restore the entire structure of a missing tooth, from its root to its crown. Dental implants consist of bio-compatible titanium posts that serve as artificial tooth roots which are easily accepted by the body and fuse successfully to natural tissue and jaw bone. Through a process called osseointegration, the jawbone grows around the implant, permanently fusing the two. A healthy, fully-functional jawbone needs stimulation from tooth roots through biting and chewing to preserve its shape and volume. This constant stimulation allows the jawbone to perform its day-to-day tasks efficiently and effectively as well as keep teeth securely in place. When teeth are missing, there is nothing to help encourage proper stimulation, and the bone will atrophy in a process called resorption. This can affect facial structure as features start to shift and sag, resulting in a prematurely aged appearance. 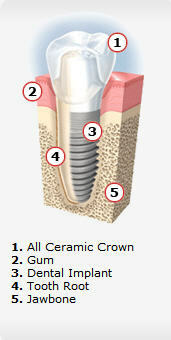 Contact San Gabriel Valley Family Dental for Your Dental Implant Consultation Today! When properly cared for, dental implants and their restorations can last a lifetime. Our San Gabriel dental practice offers dental implant treatment for those looking to improve the function, appearance, and overall health of their smile. Our team of trusted and experienced dental care professionals wants to help you achieve the beautiful smile you deserve. Call us today!